Although RNA is isolated from archival fixed tissues routinely for reverse transcription polymerase chain reaction (RT-PCR) and microarray analyses to identify biomarkers of cancer prognosis and therapeutic response prediction, the sensitivity of these molecular profiling methods to variability in pathology tissue processing has not been described in depth. As increasing numbers of expression analysis studies using fixed archival tumor specimens are reported, it is important to examine how dependent these results are on tissue-processing methods. 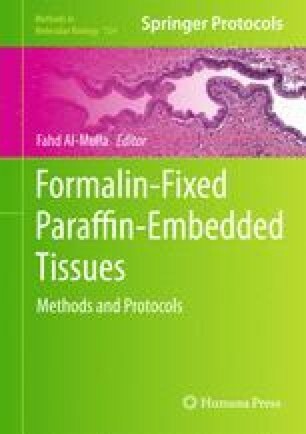 We carried out a series of studies to systematically evaluate the effects of various tissue-fixation reagents and protocols on RNA quality and RT-PCR gene expression profiles. Human placenta was selected as a model specimen for these studies since it is relatively easily obtained and has proliferative and invasive qualities similar to solid tumors. In addition, each specimen is relatively homogeneous and large enough to provide sufficient tissue to systematically compare a range of fixation conditions and reagents, thereby avoiding the variability inherent in studying collections of tumor tissue specimens. Since anatomical pathology laboratories generally offer hundreds of different tissue-fixation protocols, we focused on fixation reagents and conditions used to process the most common solid tumors for primary cancer diagnosis. Fresh placentas donated under an IRB-approved protocol were collected at delivery and immediately submerged in cold saline for transport to a central pathology laboratory for processing. RNA was extracted from each specimen, quantified, and analyzed for size distribution and analytical performance using a panel of 24 RT-PCR gene expression assays. We found that different tissue-fixation reagents and tissue-processing conditions resulted in widely varying RNA extraction yields and extents of RNA fragmentation. However, the RNA extraction method and RT-PCR assays could be optimized to achieve successful gene expression analysis for nearly all fixation conditions represented in these studies.